Current summer shoe collection, minus the “lost” favorite pair. the blue pair far right is my replacement pair, but just meh, not favs. I lost one of my favorite pairs of shoes while on vacation at the beach this summer. I hesitate to say they were stolen—that would even be okay because then someone else would still be enjoying them. But who would steal a used pair of not-fancy $29 shoes? I think they were just plain thrown away. The first night I left them outside on a landing near the door of our rental condo. They had sand on them, after all. Other items—sand toys and beach chairs were left outside as well. But my shoes—a handy pair of tan summer slip-ons, were gone in the morning. I hunted everywhere for them. Too late, I learned the condo rules said no shoes left outside. A person sweeping the porches one morning said that’s what usually happens—shoes are disposed of. And I realized that the job of sweeping stairs and porches would be made much harder dealing with shoes left outside. Okay. 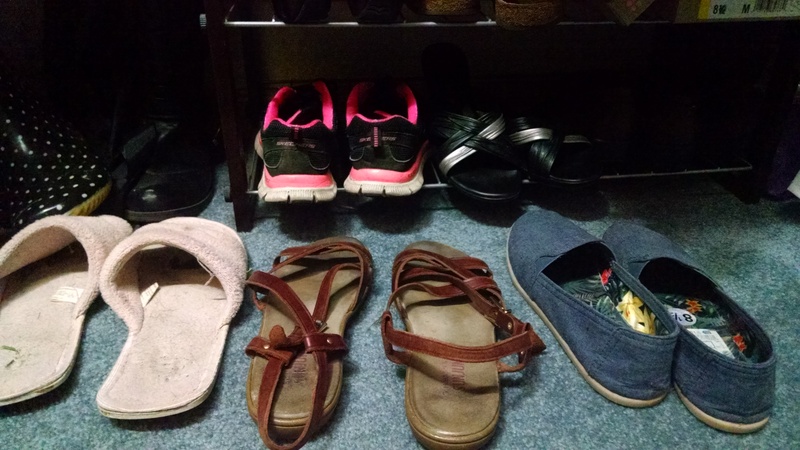 It got me thinking about other favorite shoes I have had–especially summer sandals, because I have had several favorites in the last 20 years. Two well-loved and well-worn pairs got to the place where they could no longer be worn. They were my go-to shoes all summer for a number of years, and then straps broke or in one case the surface of the soles got rough and hard over winter—not pliable to feet. I kept them several years after I could no longer wear them, they were that dear. I hate throwing shoes away, especially favorites. Have you had shoes that you hated to get rid of? When we’re young we wear the fashionable styles—perhaps with spikey heels. I used to wear that kind to work until I developed painful callouses on the soles of my feet. I think they were brought on by wearing poorly made shoes with little support, or in my case house slippers with slight heels. My feet tended to slide down those slanted slippers on the fuzzy surface. A podiatrist recommended that I buy very well made “support” shoes for work. He even wrote a prescription I could turn into my insurance. I swallowed my pride and wore dorky so-called old-lady shoes for about a year which did help tremendously. After the soles of my feet recovered, I did not continue to wear “prescription” shoes at work, but in my off hours wore well-made tennis shoes with arch support, and better-made, more expensive shoes that supported the amazingly intricate bones and padding of the feet. At least that is my memory from when I was in my late-twenties. 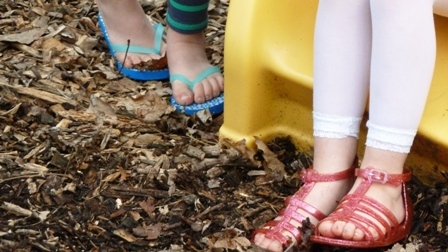 I hope this is a good reminder of how important our feet are—especially as we get older. Having shoes that feel good can be all-important to mobility and even longevity, right? Longevity because if you have shoes that don’t support you properly, a bad fall can occur and your health goes downhill with the fall. Her sisters just offer to bring her more worn-out shoes, and she ponders how their parents managed to feed, clothe, shelter, and educate nine children, to say nothing of doctor and dentist visits. “Sitting at the table in Mom’s kitchen has a way of reminding me that holes in my shoes are a very minor blip on the screen of life,” Darla reflects. Yeah, not-pricey lost shoes—a very minor blip on a lovely vacation. Have you lost or a had a favorite pair of shoes stolen? Tossed? Shoe stories anyone? This wasn’t the first time we had shoes “stolen” or disappear at the beach. Years ago my husband left his on the beach when we went for a sailboat ride with a brother-in-law. The kicker there was the tennis shoes also contained his high-priced medically-prescribed plastic custom-made inserts. Not a happy husband! I already heard that one teacher of a women’s Sunday school class used this title for the start of a discussion! One class member said it made for a good discussion on stewardship, tithing, etc. My former pastor told me that he and his wife only have three pair of shoes each: dress, everyday, and mud shoes. I found that amazing and startling. Anyone else? For more about Darla’s new book Gathering of Sisters, check here. Or write to me and I’ll send you information by regular mail (along with a free bookmark). Send a self-addressed stamped envelope to anotherwaymedia@yahoo.com or Another Way Media, P.O. Box 363, Singers Glen, VA 22834. I have more than 3 pairs of shoes, probably more than a dozen, but a modest number by many standards. They include sandals and a new crop of Skecher’s models for injury-prone feet. Until we moved, I held onto a pair of brown suede with gold edging on the stiletto heels that I associated with going fancy and making a break with tradition. In Maria Shriver’s meditation book I’m reading, she admits that the headmistress of the private school her son was attending wrote her a note alerting her to his hole-y shoes. Maria already knew about it, but let him wear them anywaybecause he was so attached to them. My shoe stories! Mom reminded me of her hole-y shoe story yesterday, of a time when a stranger at Wal-mart gave her $20 toward her groceries–he was just being nice but she thinks it was because she had her very comfy “home” holey shoes on (cut that way because of corns etc.) I still laugh about that. She graciously accepted his help but as my dad had died recently at the time, she hoped he wasn’t stalking her!! That seems very wasteful to throw shoes away and add to the landfills whether it is a rule or not. Why could they not just stick them in a box and you have to come claim them? Surely that would teach a lesson just as well.